What if you lost your memory every night when you went to sleep? The events of the day, gone; years of your life, gone. This is the situation in which Christine Lucas finds herself every morning. She wakes up in a room she doesn’t recognize, next to a man she doesn’t know, in a body that is decades older than the one she remembers. And she remains unsure whether or not she can trust the one person who appears to care for her above all others: her husband, Ben. I was surprised, when I started reading Before I Go to Sleep, that it didn’t draw me in immediately. The concept was so intriguing and I wanted so badly to be hooked but I just…wasn’t. Part of the problem is that for the past month and a half, I’ve not only been adjusting to a new work schedule (i.e. actually getting up early on a regular basis for the first time in almost a year) but I’ve also been traveling back and forth from North to South Carolina in order to work at this job. So I’ve basically been exhausted all the time, and reading has been low on my to-do list because it requires much more effort than sitting mindlessly in front of a computer or the TV. But then we picked up the keys for our new house, and I spent the days I was working there last week. The house is void of basically everything except appliances, some disposable plates and silverware, a loaf of bread and jars of peanut butter and jelly, and the guest room mattress that we brought up so I wouldn’t have to sleep on the floor. There’s no internet aside what I can get on my phone, and there’s no TV, and that ended up being the key to finishing Before I Go to Sleep. I got home from work one evening and picked it up while I was eating my solitary dinner of peanut butter and jelly and finished it only a few hours later. So, my conclusion is that it was totally my fault that I wasn’t as hooked as I wanted to be for the first third of this book, because I finished the rest of it in a mere three hours, maybe less, and it was quite a ride. We experience most of the story through Christine’s journal, which she discovers hidden in her closet after receiving a call from a man claiming to be her doctor. The most unsettling entries come on the days after she has not written; she can’t remember the previous day at all, and only knows about things that happened before that because of what she wrote down. She sometimes feels shadows of memories flitting through her mind but can rarely grasp them before they flutter away again. But mostly, she can’t remember the last 25 years of her life at all, and has only vague memories of what came before that. 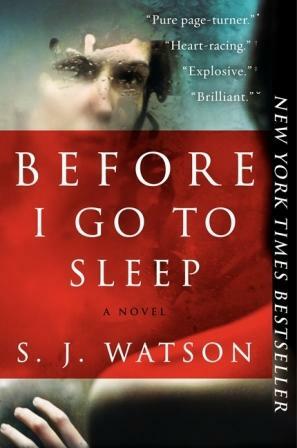 I was initially skeptical of how well the story would progress—after all, if she’s relearning her entire history every day, how could she have much time to record anything new in her journal?—but Watson is a hell of a writer and pulled it off incredibly well. I would definitely recommend this to anyone who enjoys psychological thrillers, especially if you wondered about the potential dark side when you watched 50 First Dates. I LOVED that book. It hooked me right away. I wish the movie was a bit better. Have you seen it? I didn’t even know there was a movie until I was looking for an image for my post! I feel like it would be hard to make into a good movie so I’m not super surprised it wasn’t great. It took me a while to get into Before I Go To Sleep too, so maybe it was a slow starter. Perhaps! It definitely sped up in the middle though! I’m not much of a mystery reader, but a friend highly recommended this book to me. I loved it! I’d read stuff like this every day of the week. It’s creative and interesting and well written. I’m a fan. Yeah, I ended up really liking it! I don’t know what didn’t grab me in the beginning—I think it might have been the tenses changing back and forth and I was never sure whether we were in “present day” or the journal—but I just ripped through the last two thirds of it! And I would definitely take “mysteries” like this (more like psychological thrillers, maybe?) over a more routine murder mystery any day. I listened to the audiobook version of this and loved it! I liked the movie too, but I watched it a long time after reading the book so I didn’t remember a lot of details. Also, Colin Firth was in it and that may have something to do with why I liked it.